A fox that became ensnared in an illegal animal trap has been found dead in Waterford, Hertfordshire. Resident Dan Ballam was out with his dogs when he discovered the creature, whose leg had been severed by a gin trap. He said: “My dog picked up a scent and went a bit crazy. 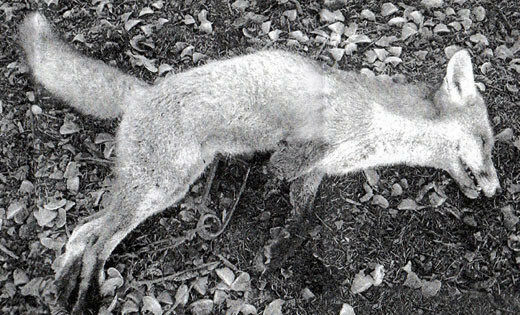 The I saw the fox, dead, lying with the trap on its front leg. Mr Ballam’s wife, Sue, had seen the fox limping on three legs the previous day, Sunday, in the grounds of the Goldings estate, Hertfordshire, but it staggered out of her sight. The Ballams called the Royal Society for the Protection of Cruelty to Animals (RSPCA) which searched in vain. He said that a dog or a child could have been caught in the device, which was outlawed in 1958 and comprises a pair of metal jaws that string together when triggered. The penalty for setting a gin trap is a fine of up to £20,000 and six months in Jail. The RSPCA removed the fox on Wednesday and is investigating. It is not known who set the trap. A spokeswoman said: “Gin Traps are so dangerous to wild animals as well as pets, and they could be dangerous to people. “It will usually result in at least an amputation to a limb. They shatter the bone. It’s a really unpleasant way to die. Anyone with information about the incident should call the RSPCA on 0300 1234 999.